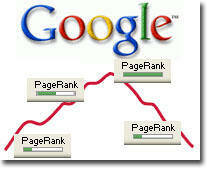 There’s been a lot of talk on other blogs and forums lately about when the Google will update their PageRank. Generally it’s every 90 days according to most, but it’s been longer than that since they’ve last done an update. I noticed yesterday that self proclaimed dot Com Mogul, John Chow was bumped down a notch (from PR6 to PR5) – ouch! Google Lady is still at PR6 and interesting enough John Cow (Chow copy cat) doesn’t have a PageRank yet – I guess they can’t rate animals. There’s been some reports from webmasters that their PageRank has been updated already (within the last few days), but nothing is for sure. What I do know is that my site (the one you’re reading) has a PR1. Hey, at least I’m not at zero like someone I know. Darren Rowse made a video post yesterday on why you should forget about PageRank and focus on creating a better blog. What’s your site’s PageRank? Find out here.